Eating well in Venice – it is known – it is not so easy. Being studded by exploit-tourists restaurants, it follows that the average quality of the restaurants in the city is certainly not excellent. It is even more difficult to find restaurateurs who propose authentic dishes of Venetian culinary tradition. Swamped by the prevailing globalization, the genuine Venetian cuisine is in danger of disappearing. Yet our kitchen has centuries of history: enriched and deeply influenced by contact with distant cultures; over the centuries it has created its own identity, with peculiar characteristics. Arabs, Byzantines, Armenians, Greeks and Hebrew elements had merged to create a series of dishes that, unexpectedly, are very simple but as the result of a wisdom that enhances ​​the ingredients (which are often exclusive of the Venetian lagoon). Beyond some typical tavern where you can still find some traditional dish, it is now possible to enrich this experience being welcomed into a private house in Venice, where a Venetian cook will cook privately for you. No crowd, then, or tables promiscuous, nor great voices in the background, but the quiet of dinner in a private home in Venice just for you, to feel, at least for one night, a true Venetian. The service includes the pick-up at your hotel or where is more comfortable for you and the escorting up to the house, where you will be welcomed as in family, and settled for dinner. 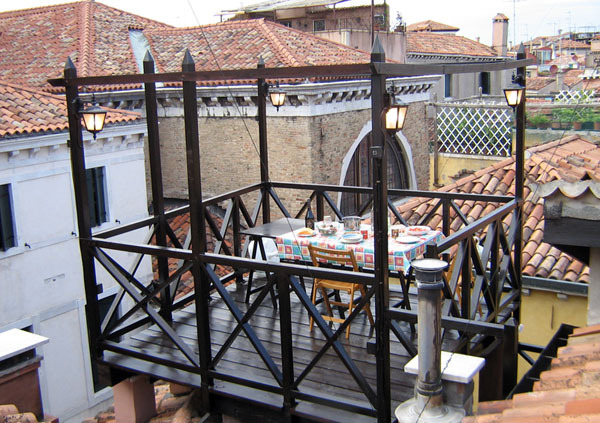 During the warmer months you can dine on a spectacular roof terrace with stunning views of Venice. 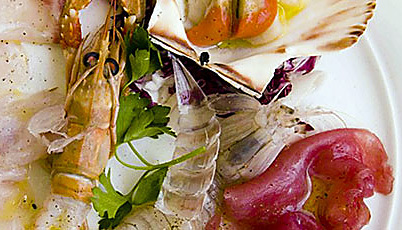 The menu can be a choice among fish or meat and includes appetizer, first course, main course, dessert, wine and water. It is also possible to organize a cooking class. Questa voce è stata pubblicata in Servizio turistico e contrassegnata con cooking class, eat in Venice, private service, Venice cuisine. Contrassegna il permalink. What a fantastic idea. I am going to recommend it to my destination wedding clients who decide to honeymoon in Venice. nous pouvons vous offrir beaucoup d’autres services pour les mariages. N’hésiter pas à nous contacter pour autres renseignements. I wish I had known about this dining option last month. I was in Venice an in search of a wonderful Venetian dinner. Maybe next time!